Read German fairy tales from The Grimm Brothers, Margaret Ardnt, Charles John Tibbits and more. Jump to full list of German fairy tales. About: Germany is a country with a long and rich tradition in folklore, with stories many know and love. It is the home of beloved German fairy tales with characters such as Rapunzel, Little Red Riding Hood, and others. Germany is also the birthplace of the Brothers Grimm, storytellers who collected fairy tales and folklore from around the country. German fairy tales are perhaps some of the most beloved stories for children and adults. A new museum dedicated to the Brothers Grimm opened in September 2015, and features attractions based on these beloved stories. Germany isn’t just known for the Grimm fairy tales, however, as the country also brought us other collections of German folklore, such as Fairy Tales from the German Forests by Margaret Ardnt and Charles John Tibbits’ Folk-Lore and Legends: German. National Monument to the Brothers Grimm in the Grimm’s birthplace of Hanau, Germany. Sculpted by Syrius Eberle and unveiled October 1896. German folklore is similar to the folklore of Scandinavian and English cultures because all three have origins in a Germanic mythology. The country’s folklore tradition is characterized with peasants who become heroes, woodcutters who have children, and royalty that has fallen under an enchantment. Many German fairy tales or folk tales feature a female protagonist, and often the character ends up marrying royalty, thereby elevating their social stature as a reward for being “good.” Most German folklore stories feature a romanticism of natural spaces, in particular forests, and in nearly every story, the villain gets his or her retribution, thereby teaching a moral tale, with values important to the culture. The message is clear- goodness and kindness are rewarded, while cruelty and selfishness are punished in German folklore. 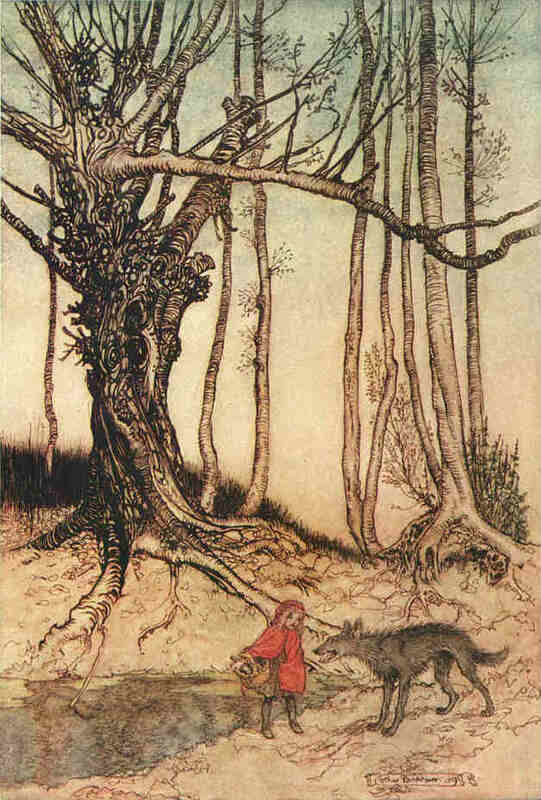 “When she got to the wood, she met a Wolf.” Illustration of Little Red Riding Hood by Arthur Rackham from The Fairy Tales of the Brothers Grimm, published 1909. A wandering hero is often present in German folklore, as the protagonist either leaves home to seek their fortune, or is cast out by a family or other forces. The hero’s journey often involves a helper, such as Cinderella’s fairy godmother, and sometimes the character’s morality is tested in German fairy tales. To get their happy ending or wish, the hero often has to overcome a difficulty. Objects often have magical properties that can aid the hero in their quest, and the hero is very clever in German fairy tales and folklore. The folklore of the Grimm Brothers and other German storytellers often comes from oral traditions, stories passed from person to person over the years. 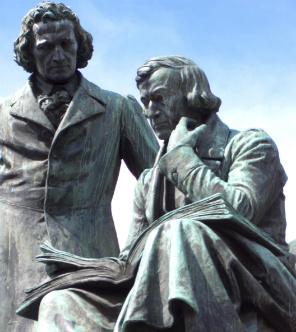 The Grimm Brothers invited local storytellers into their home, and would transcribe the tales told there, changing elements they wanted to make the stories more moral and accessible, and adding spiritual elements they deemed necessary. German folklore is grounded in the national culture as evidenced by tales that specifically mention certain locations and places.